What's the scene at your house in those last few minutes before guests arrive? You in the kitchen, trying to make sure the food is just right, the kids running around, dragging out the clutter you just put away, the phone ringing in the background while you try to remember where you put your favorite candlesticks? Or maybe you just got a call that guests are on their way for a surprise visit and the house is just not ready for it. Sound familiar? Yeah, me too. That's why I sat down and put together this little checklist to help me focus during those last crazy moments before the party starts, and I'm sharing it if you need one, too. I've listed the steps in order of priority, so if you run out of time, no problem, you know the important jobs have been done first! 1. Start at the entry. I definitely don't want my guests tripping over a pair of shoes or walking through a spiderweb to get in the door. So, I check the front door and foyer, clear away any junk, and make sure the first impression is welcoming. I love it because it can go from carpet to wood floors and everywhere in between. And the one-step removable pod allows for easy cleaning on stairs. And since it's small and easy to store, you can hide it away in the closet before the guests arrive. 4. Freshen the bathroom. There's something like a 50/50 chance that your guests will be visiting the restroom while at your house, so check that everything is in order in there. Clean the toilet, wipe down counters, make sure there is toilet paper and soap, and then hang a clean hand towel. I have an extra hand towel always clean and ready under the sink, so I switch out the dirty one just before we have company. They may not even enter the bathroom while they're there, but it needs to be ready in case they do! 5. Empty the trash. Whether in the bathroom or in the kitchen, the trash should be empty so the room looks better and smells fresher! This is another task that's great to assign to the kids! 6. Clear cobwebs. This is a good one if you'll be sitting down to eat at a table with a chandelier. I'm embarrassed to say how many times I've sat down with company only to look up and notice a forgotten cobweb on the light fixture! Ugh! This is another great way the BISSELL comes in handy with the long-stretch hose. By the way, make sure you do this before setting the table. You'll want to wipe the table down afterward to clean up any falling dust. 7. Mop the floor. Maybe some of you would put this higher on the priority list, but unless there is a sticky mess or major dirt, I wait until the other steps are done first and then do this if the time allows. 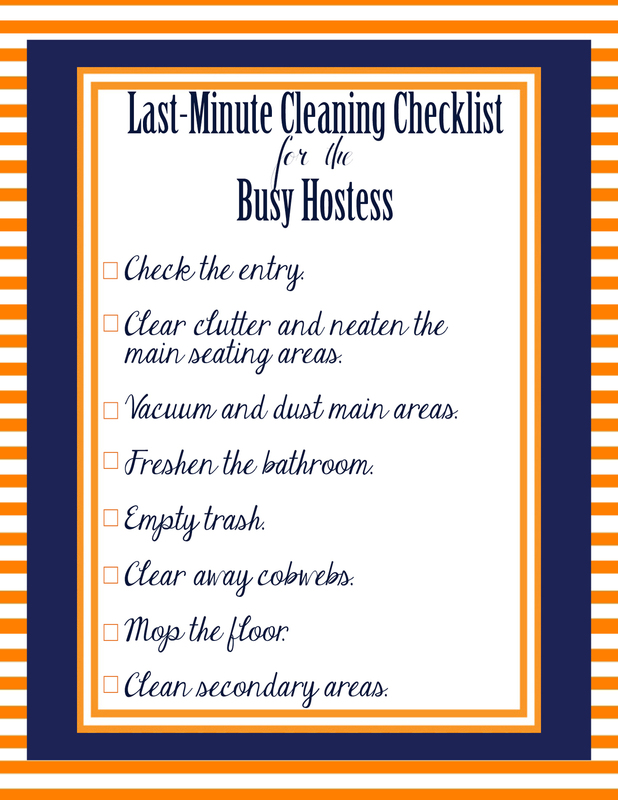 Even when I've had time to plan ahead for a party, I try to wait to mop until the last few moments so I can clean up any of the messes I've made while cooking. And it leaves the kitchen smelling fresh, too! I know this list contains nothing you don't already know, but sometimes having my jobs listed out in priority order helps me stay focused when time is running out. If you'd like a printable version to keep handy, click here to download!